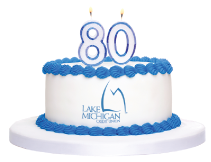 News from LMCU: 80 Years of LMCU! It all started in October of 1933. Originally known as the Grand Rapids Teachers Credit Union, LMCU has become the largest locally-headquartered financial institution in West Michigan. Obviously, we could never have done it without your support, and that of over 270,000 of your fellow members. And we’re celebrating! Starting October 1 until October 31, 2013, you can enter to win $500 by visiting our home page at lmcu.org or any branch location.